Jojoba - in case you, like me, have wondered how to pronounce this word it's HOHOBA. So now we've got that out of the way, let's talk about the use of jojoba in beauty - it has moisturising properties, help control skin oils, help with spots, comforts chapped lips and heals cracked skin. Who knew that jojoba oil is going to be the next big thing in skincare oils? 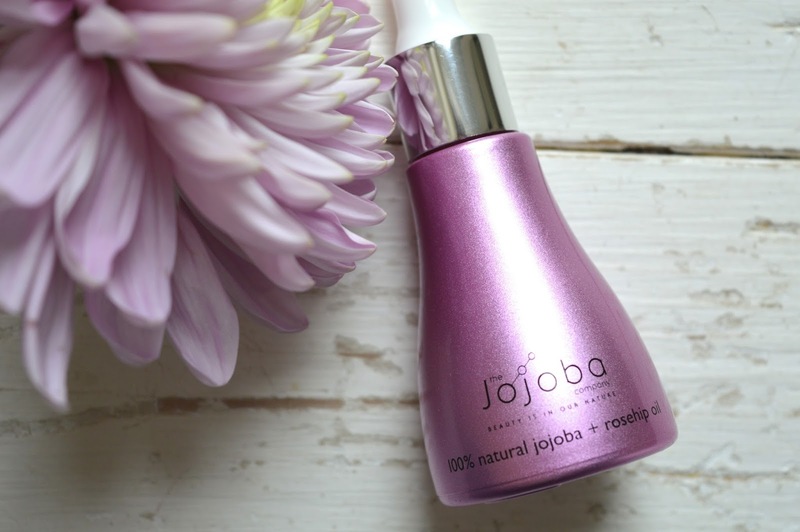 I have been trialling the 100% natural jojoba and rosehip oil from The Jojoba Company - an Australian brand who also sell in the UK (here is the link to their UK site) who are experts in natural Australian jojoba within beauty. The brand has excellent values taking all of their jojoba from their family farm - AND they don't test on animals, don't contain animal derivatives, no artificial fragrances, no chemicals, no perfumes. Whilst we're on the topic of animal derivatives - did you know that most wines are not vegetarian friendly? Whilst we all sit and think that all wine is fermented grapes, it's actually finished with several animal products including casein, albumen, gelatin and isinglass. Do you know what isinglass is? It's basically fish bladders. YUM. Think about that next time you're sipping your favourite Sauvignon! Anyway, back to beauty which is why we're all here - jojoba is fab for the skin. It's packed with vitamins like Vitamin A which is important for skin cell regeneration; essential fatty acids omega 6 and 9 which help repair damaged skin tissue; antioxidants which soothe and protect skin against ageing; docosenol which is a saturated fatty acid and is used in cold sore treatments. After cleansing my face, I use 2-3 drops of the jojoba oil to massage into skin, then follow with my moisturising cream. I use it morning and day - the great thing is that even though it's an oil, you can still use it in the morning and apply makeup on top! I'd expect it to run but actually jojoba sinks in pretty quickly. I'm hoping that the oil will help me clear up my current spot outbreak because rosehip is also brilliant at helping at getting rid of imperfections and heal scars. On a daily basis, the oil helps my skin look bright and healthy, and reduces any tightness - a pleasant feeling to have through the day.